A London council has suspended an elected NUT official. Julie Davies, Haringey NUT branch secretary and a vocal supporter of the Save Downhills anti academy campaign, was suspended just before the end of the summer term. 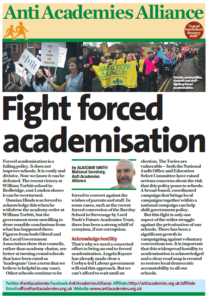 This week the NUT will challenge the Council at the High Court. Watch Rhonda Evans’ film on the battle against the forced academy programme. Downhills school legal battle ends. 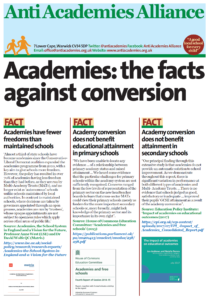 The Save Downhills campaign, which incorporated parents, teachers and supporters and was backed by the National Union of Teachers, had judicially reviewed Education Secretary Michael Gove’s decision to turn the school into an academy. 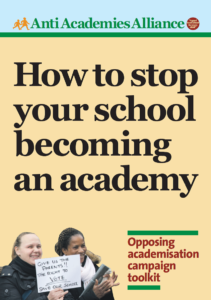 Posted in Academy watch, News, Uncategorized	| Tagged downhills, Forced academisation, Harris	| Comments Off on Downhills school legal battle ends.